Phil, I watched your first video in which you had some problems getting the B17s to work and coincidentally was having a go myself at the same time as you were doing the second livestream and saw it as soon as I had got mine working OK. Same idea with left formation. They were both formed the same distance from the lead box as when you did it. If you select Wing Position Right it does place it further out. I cannot say that is why I had no problem but I put it out there. I also did a test with four AI Expert third reich spitfires attacking 12 Expert B17s and the first time they comfortably decimated all four spitfires and the second time 3 B17s were lost before the spits all died but that may be because I started the spits closer in and they were able to shoot down three very quickly before getting killed. If they had started further back maybe the gunners would have got them before they could start shooting at the bombers. Incidentally, I saw on the forums that there was some debate on ED forums about how to set the 'Response To Threat' to make the gunners shoot without the bombers breaking formation so I set one formation to 'Passive Defence' One to 'No Response' and one to 'Horizontal movement to avoid Flak' (or something like that) All three formations fired at the fighters while remaining in formation. 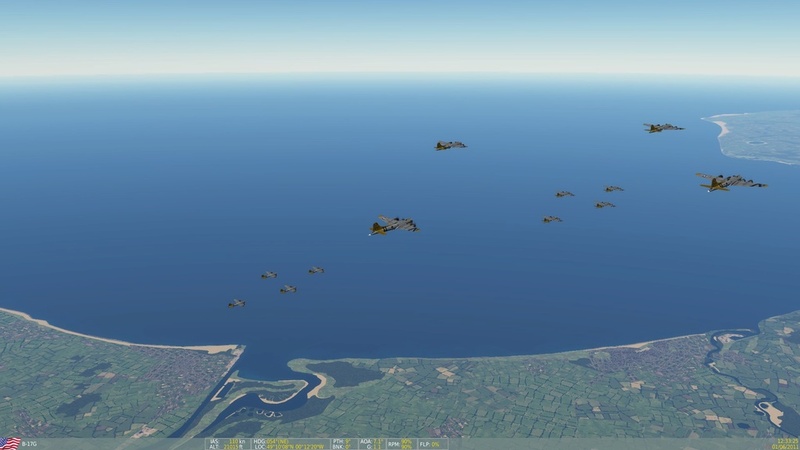 You did not set anything so it looks like the default works as well though the reason for the debate on the ED forums was that someone was complaining that his bombers scattered in all directions whenever they were attacked. I think he just had a box of 4, perhaps making the bombers members of a WW2 bomber formation etc stops them dodging? Actually, looking at the screenshot I took, maybe using Group Position RIGHT does make them form further apart than your method does. The default spacing is set at 800ft. If it turns out that this method solves the problem with bombers flying the wrong way it is still possible to change the spacing to whatever you want. I saw you got it working, I was just saying that you still had issues with the other boxes spawning going the wrong way and the way I did it did not cause that problem. It could just be coincidence though I did not try adding a fourth box at the rear. I will give it a go and also try your method, which does seem the obvious way to do it. I can't remember why I ended up using Group Position instead of Box Position. I know I tried several methods.